Fish dishes very tasty and useful, because they are so much necessary for our body calcium. The main thing is to cook the fish. If you want to do it in simple way from a simple product available, prepare it in the batter. Your family will be pleasantly surprised. Take the frozen cod and put in cold water, adding a little salt. This will allow you to quickly thaw the fish, retaining the essential juices. After defrosting fish it needs to be cut. Cut the head, tail and fins. But do not discard. They will be useful later for making soup. Innards frozen fish, as a rule, no.Cut the fish along the spine. This will allow you to split it into two parts. Select the remaining bone. Rinse well with cod. Cut the fish into small pieces. Salt and pepper on both sides. Squeeze lemon juice and sprinkle them with fish. It will add spice to your dish. Prepare the batter. To do this, sift a Cup of flour, add salt to taste, break the two eggs. And gradually adding the boiled water, stir the mixture with a wooden spoon until then, until rid of all lumps. Prepare the fryer. If you have not, you can use a normal deep pan. Pour it in vegetable oil, heat it. Cod will need to fry in boiling oil. Dip your cod pieces in the batter and lay into the pan. Fry on both sides for long, not more than 5 - 7 minutes, the fish was not dry. 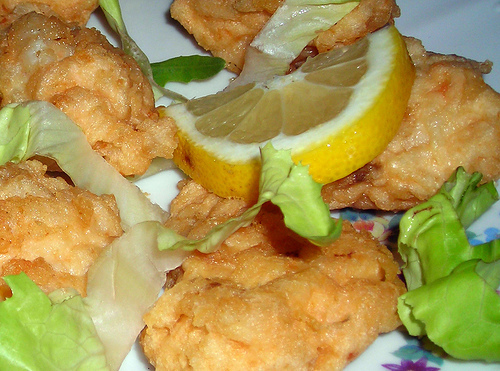 Serve cod in batter, you can cut fresh vegetables or with rice.